History or Legend? Sometimes it is difficult to choose the right word. Here, I chose to use the word ‘Legend’, as I have not been able to verify the authenticity of the stories I heard from an old man living in the Kumbhalgarh Fort. He told us that he was a native of Kumbhalgarh, and had also worked for the Archaeological department in the fort, lending a touch of credibility to the story he told us. I must admit, that though we have fallen into the habit of taking in stories with a pinch of salt, there was an air of truth about this man. Needless to say, the king agreed. The Guru led the king up the mountain, where the fort now stands, and told him to cut off his head. The place where the head fell would be the main entrance of the fort, and where the body fell would be the palace. The king did as he was told. The guru’s head fell at a point where the Bhairon Pol stands today, and to the great surprise of everybody, the headless body walked a further kilometer up the mountain and finally fell right at the top, where the palace was later built. This is a wonderful story, which gains authenticity when I add that just past the Bhairon Pol , there is a small temple-like structure, which has a stone covered with sindoor ( a red powder), which we were told was done to mark the place where the great saint sacrificed his life for his king. The fort was named 'KumbhalMer', after the king, as well ashis guru. It was only later that the name 'Kumbhalgarh', or 'fort of Kumbha' became famous. However, this story finds no mention in a book that I bought about the history of Kumbhalgarh. Maharana Kumbha not only built the fort, the palace and 60 Hindu temples, he apparently took great care of the Jain temples too. The main Hindu temple that he built was that of his chosen God, Neelkanth Mahadeo. It is said that Rana Kumbha was an extraordinarily tall man, who, when he sat, came up to the height of the Shivaling (5 feet), and could encircle the lingam with his hands. This seems a trifle exaggerated, but then, one never knows, besides, it is possible that with the headgear and the kind of clothes they wore, he could possibly have appeared as tall as 9 feet, which was the height we were told he was. In any case, it is another fact that it was when he was worshipping this Lingam, that he was stabbed to death by his own son, Uda Singh, who was the father of Maharana Pratap. Quite a sensational story, is it not? Now here’s another story, which finds no mention in history books, but is interesting enough to be written down. Maharana Kumbha had started a system of lighting a huge lamp, with 100meaures of oil, and a wick made with 50 measures of cotton (I am not mentioning the measures, as the ones told to us were in the local tongue, and didn’t make much sense to me). The light from this lamp was bright enough for the farmers of Marwar to work during the night, and was seen as far away as Jodhpur. The queen of Jodhpur, known as the Jhali Rani, saw the lamp and appreciated the king who cared so much about his subjects. The king didn’t like such praise of another king, and banished the queen telling her to go to the one she appreciated so much. Left with no choice, the queen started for Kumbhalgarh, and sent a message to Rana Kumbha explaining her situation. The Maharana welcomed her as a sister, and gave her a palace to live in, without any slur being made on her reputation. This is the palace where there is a Durga temple, and the palace is called ‘the palace of the Jhali Rani’, after her. When her husband came to know of this, he marched with an army towards the fort, intending to take her back by force. He approached the fort from the rear, passing through thick jungles which are today, part of the sanctuary. He found it extremely difficult to move through the forest. He had to cut down trees to make way for his armyKumbha advising him not to use force, and stealthy means, and that he would get what was d, and the trees seemed to grow faster than he could cut them. At last, a message arrived from Rana ue to him if he approached with humility. The Jodhpur king realized his folly, and asked permission to come to Kumbhalgarh. Rana Kumbha welcomed him with full honours from the Victory gate, and treated him as he would treat a son-in-law. (In India, a son-in-law is treated with even more respect than one would treat an equal). The king stayed at the fort for a few days, and took his queen back with him. When he returned, Rana Kumbha felt that, as he had considered him a son-in-law, he must give him ‘dahej’ or dowry when he returned, and gifted him the whole area of Marwar from Kumbhalgarh to Falna. Such was the large heartedness of this great man! Another legend that surrounds Rana Kumbha is the story of Muchhal Mahavir. 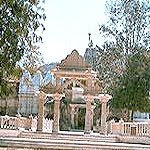 Muchhal Mahavir is a Jain temple dedicated to Lord Mahavir, at Ghanerao, which is on the route from Falna to Kumbhalgarh. This temple too has its origin long before Rana Kumbha came on the scene. The story goes that once, when the Rana was on a hunt, he came to the temple where he was offered refreshment by the priest. The priest offered him the Prasad of the Lord, and the Rana was amused to find a strand of white hair in the Prasad, which must have fallen from the priest’s head. As a joke, the Rana asked the priest “what! Does your Lord have a moustache?” the scared priest, without realizing what he was saying, replied in the affirmative. Carrying the joke further, the Rana refused to pay his respects to the Lord that day, and told the priest that he would return after 3 days, and wanted to see the moustache of the lord! The priest didn’t know what to do and spent the next two days in prayer. When he did not see any results, he decided to commit suicide rather than be killed by the king. When he picked up the dagger of Bhairon at the temple to kill himself, the Lord appeared before him and advised him to cover the face of the idol with a piece of cloth and ask the king to remove the cloth himself after offering prayers. When the king arrived the next day, the priest welcomed him warmly and asked the king to have a bath and offer prayers to the Lord himself. Seeing the cloth covering the face of the idol, the king got angry and demanded an explanation. The priest repeated to the king what he had been ordered to do by the Lord. The king agreed and offered his prayers to the Lord, and when he opened the cloth, Lo and Behold! The idol of Mahavir not only had moustaches, but also a beard!! The king repented for having made such a joke and asked forgiveness from the priest. He was, needless to say, forgiven, and the beard and moustache disappeared. But the name has stuck. The Lord has, since then, been called ‘Mucchal Mahavir’, or the Mahavir who had a moustache. Nice log and stunning pics Anuradha shankar. Just One correction....Rana kumbha was stabbed by his son Udasingh I, while Rana pratap's father was Udaisingh II ( who founded udaipur city) Both were different. Infact Udasing I was a uncle of udaising II's father Rana sangramsingh. Very well documented and maintained . Thank you for reviving the glory of the past .